Bicycle tour of Columbus, Ohio — Yay Bikes! Columbus’ original city-wide ride since 2008, Bike the Cbus is a bicycle tour, for all ages and abilities, highlighting our city’s many attractions and unique neighborhoods. Experience the energy and excitement of Columbus while supporting Yay Bikes! mission to influence the conditions that help people safely and comfortably ride bicycles for transportation. Bike Routes: The ride features three routes, a 30 mile, city centered route, a 62 mile metric century and an ALL NEW 10 mile family route! All routes will begin and end at the Grange Insurance Audubon Center, 505 W. Whittier St., Columbus OH 43215. All riders should return to the Audubon Center no later than 2:00 p.m. Please plan your ride accordingly. $55 On-site Registration at Packet Pickup on Friday night or Saturday morning. *Child registration is for kids under 18 on their own bikes who are accompanied by an adult. Toddlers or infants in a trailer or child seat on an adult bike ride free and do not need registration. Helmets are required for children under 18 by law. Registration includes a swag bag, course map, SAG support, rest stops with snacks and wrench support, and a fantastic finish line festival, sponsored by Kenda Tire, which includes a full lunch! 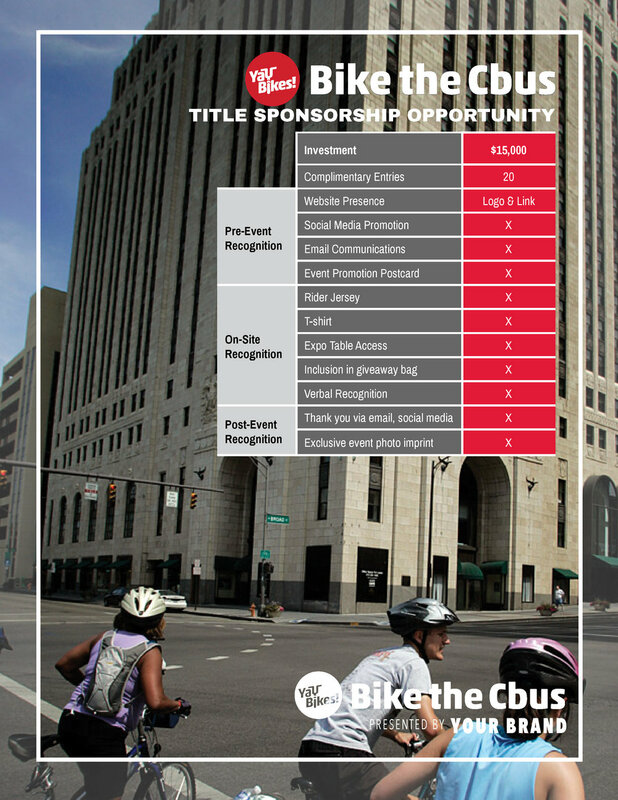 All registrations received by July 31st will receive a specially designed Bike the CBus t-shirt. New this year - Bike the Cbus Jerseys and a vendor expo! We will have a vendor expo on Friday night from 5:30 - 8 pm during packet pickup and on Saturday from 9:00 am to 2:00 pm. Bike the Cbus jerseys will be available for order! Watch for more details coming soon! Once again this year we will have a Bike the Cbus Raffle! Last year we gave away over $1,500 worth of items! Tickets are $5 each or 10 for $20. Raffle items include gift cards to local restaurants, museums and shops, sporting events tickets and more! Attend packet pickup on Friday night and get one ticket FREE! Raffle items will be on display and tickets can be purchased during expo hours. You will have the ability to choose which items you would like to win. Winners will be drawn at 2:00 p.m. on Saturday. Winners do not need to be present to win! All raffle items are donated and all proceeds go directly to Yay Bikes! Packet pickup and on-site registration will be available on Friday night, from 5:30 - 8:00 pm at the Grange Insurance Audubon Center, 505 W. Whittier St., Columbus OH 43215. Ride day registration will be available beginning at 6:00 a.m. Registrations are non-refundable, but they are transferable.